Following last night’s 5-2 loss the Pioneer’s were seeking a much needed win before taking a few weeks off for winter break, but were unfortunate in doing so. Denver fell 6-2 to the St. 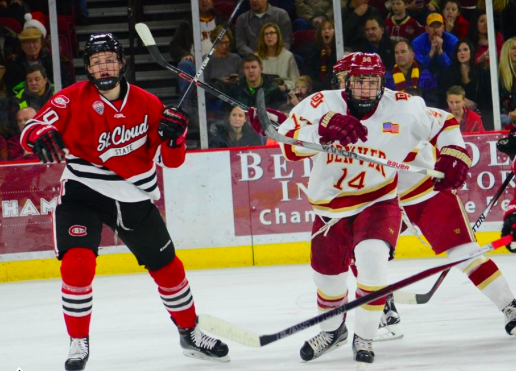 Cloud State Huskies, after making changes in an attempt to recapture the Denver-style level of hockey this team is capable of performing at. Denver’s alterations began with scratching last night’s forwards Emil Romig and Logan O’Connor, defenseman Matt VanVoorhis, and goalie Tanner Jaillet with Colin Staub, Rudy Junda, Brad Hawkinson, and Evan Cowley. The starting offensive line we’ve seen most of this year consisting of; Trevor Moore, Dylan Gambrell, and Danton Heinen was changed to Heinen, Quentin Shore, and Troy Terry who provided the Pios with the most threats in tonight’s game. The adjustments worked well for the Pios during the first period, as Denver came out noticeably tenacious and energetic. While the Huskies were the first to light the lamp 3:38 on a poorly defended goal, Denver held their ground and managed to get one of their own off a power play. Senior assistant captain, Gabe Levin netted his third of the year in the 15th minute off of a rebound from Colorado Avalanche prospect, Will Butcher. “[I] thought [they] dominated the game the first five minutes and [I] thought [we] carried the last 15 of the first period,” added Coach Montgomery in a post-game interview. Denver outshot the Huskies 10-8 and saw great chances, many of which were created from the dynamic Henien, Shore, and Terry line who’s chemistry was undeniable. The second period was troublesome, to say the least, for Denver. 18 seconds into the period, St. Cloud State took the lead when center, Kalle Kossila, found the back of the net to tally his first of three goals by the end of the night. Less than one minute later the Huskies buried their third goal from senior left winger, Joey Benik, marking his second of the match. Denver reacted by substituting Jaillet for Cowley, who had no such luck as Kossila converted his second after firing a shot past Jaillet, who Coach Montgomery says got hung out to dry tonight. The Pios weren’t nearly as aggressive nor creative with the puck during the second as they were in the first. The Huskies outshout Denver 16-7, a statistic that greatly reflected the attitude and intensity of play from each team during the middle frame. The Huskies extended their lead 5-1 off a one-timer in front of the net scored by Daniel Tedesco 3:21 into the third period. During the media timeout Greg Ogard replaced Jaillet in net for the Pios. Senior captain, Grant Arnold was sent to the penalty box for cross-checking, the Huskies managed to kill the penalty. However, when Arnold returned to the ice he grabbed a loose puck Moore had been battling to get and Arnold sniped in his third of the year in the 8th minute to decrease the visitor’s lead. There are still a lot of positives to take away, even from a 6-2 loss- especially recognizing the youth within the team and how much the freshman class has stepped up throughout this season so far in hopes to come back from this four-game losing streak. Denver returns to Magness Friday, Jan. 1 against Notre Dame, puck drop is at 7:36 p.m. Going forward Coach Montgomery is not anticipating on continuing to share time in net; Denver has been outscored 20-5 over the past two weekends; Trevor Moore’s assist continued his streak of earning at least one point in every collegiate game he’s played against the Huskies; Will Butcher received his 10th assist tonight (he leads the team), Tanner Jaillet led the three goaltenders in saves with 13, Freshman defenseman Blake Hillman didn’t return the third period due to a tweaked hip-flexor injury - but is expected to be alright. This may be the worst stretch of hockey I have seen from DU in the last 20 years. All is not lost - they are at .500. The defense seems slow and the offense lacks creativity. The PK non-existent. They need a break. The complaint has been that DU lacked size but that should give them a quickness and speed advantage. Yet, they look slow. A surprising stretch. Now is when leadership counts. Whoulda' thunk... that our goalie Greg _freaking_ Ogard would get ice time in a league series with St. Cloud? We still have half a season to get it together. Keep in mind the slow starts UND had the previous few years, followed by a strong second half. It's possible. But the goaltending has got to get way better for that to happen. Any team is going to unravel if they're constantly trying to climb out of a hole. When it rains, it pours. More of the same Sat night for this slumping DU hockey team. I think the holiday break comes at a bad time--Pios need to play their way out of this, not get more time off. Still a lot of hockey to play. Hopefully this slump ends when the Irish come to town.